Prior to this change, the only way that specials and last minute discounts were showcased on the beGadgets was via static icons. 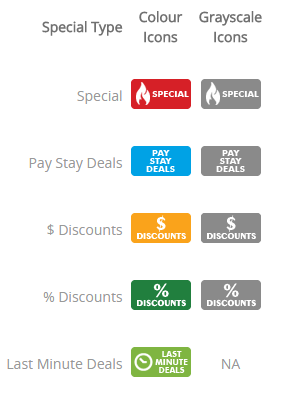 These icons would flag a product as a "Hot Deal" or "Last Minute", however would only display in the event the website visitor was searching the exact number of nights applicable to the specials created. Further limitations included the fact that visitors to your website had no information provided explaining a special's details, as a special's name and description was not displayed via the beGadgets. We have updated the default beGadget icons presented to website visitors when viewing specials. These icons have been simplified for desktop and mobile devices whilst providing a clear indication to the visitor as to what each icon represents. We have updated both the region beGadget and the Operator profile page items beGadget so that the special type and description will be clearly displayed to your website visitor. A generic description will display when the website visitor hovers over the icons for participating Operators, stating "Specials Available" or "Last Minute Rates Available". These are generic, as the region beGadget displays the best available rate, and the Operator may have mutliple products each with their own unique special applied. The rates displayed on the region gadget's price grid are hyperlinked, whereby when the website visitor hovers over the rate, they are provided with the special's name and description. If your beGadget has the inline parameter set a hover will not display and the website visitor can instead click on the specials icon, taking them through to the operator's profile page. The details and map tabs will display the special/last minute icon, with a click action to the Operator's page items beGadget. The map tab will additionally display the icons on the pop-up when a product's pin is clicked. When on an Operator's page items beGadget, the specials information will display as a hover over the icon or the monetary rate for each product listed. Text will also be displayed under the new specials icons, providing a brief description of the special type. Again, if your beGadgets have the inline parameter enabled, the special description will not display as a hover. On the item beGadget, the special description will be displayed when the website visitor clicks the 'more' button, or clicks on the special icon itself. These actions will result in the description expanding, with the special offer and room description displayed underneath the product name. This functionality is ideal for mobile and tablet devices. Along with the new styling and more information, comes the opportunity to upsell from the operator's profile page items beGadget. Say for example, a website visitor has searched for a 3 night stay and, for the date range searched, theoperator has a special offer based on a minimum 4 night stay. 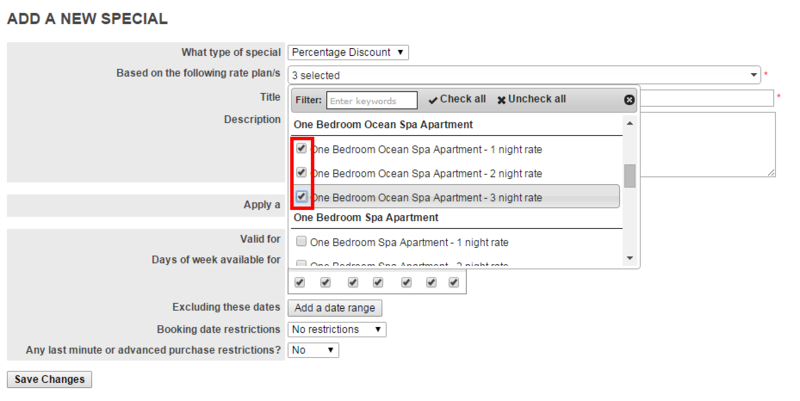 The new specials functionality will display a grayscale icon indicating that a special is available for their dates. In this scenario, the website visitor will still be provided all relevant information regarding the special. They will also be able to click on the icon, which will automatically adjust the number of nights selected in the gadget to the number of nights required in order for the special to be applicable. In addition to changes to how the specials will display on the front-end of your website, we have additionally enhanced how operators can create Specials within their Operator console. When adding a new special, your operators will now have the ability to select multiple rate plans, where previously a special could only be applied to one rate package and then the special duplicated for different rate packages. The Bookeasy Help Guide has been updated to reflect the changes as to how the specials can be created in Operator Consoles. Please find a direct link to the help guide here.